Eastfield led Harper in the fourth set; match point to the Harvesters. Outside hitter Kerstin Fredrickson dug the ball from a Harper serve to setter Kalli Caddell, who set it for outside hitter Keishla Reyes toward the left side of the court. Reyes said she knew what was about to happen. “When she set me, I thought, “Let’s go. I’m getting this point,’ ” she said. Reyes gave the ball a hard hit for the kill. It bounced off the hands of the blockers and out of play, giving the Harvesters their first ever national title. Following the kill, Reyes threw her arms in the air in triumph and joined the rest of the team. Tears poured down every face as everyone jumped, cheered and hugged one another. Middle blocker Payton Costlow said the victory meant everything to the team and they had their sights set higher after last year’s third-place finish. 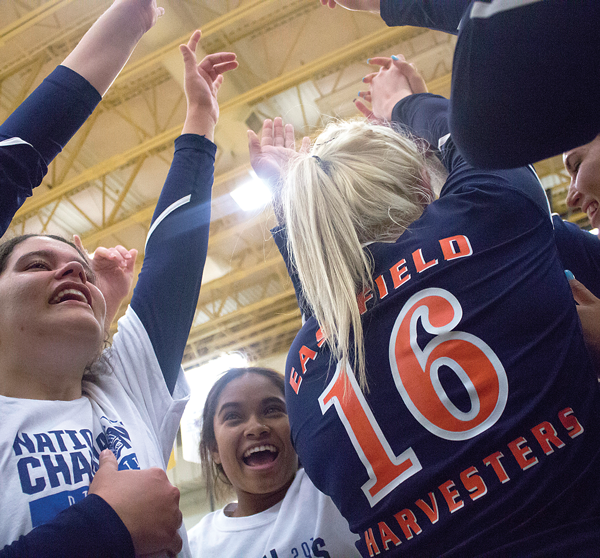 The Eastfield volleyball team became the first women’s team in school history to claim a national championship. Four of the men’s teams have won titles: basketball in 1997 and baseball in 2001, 2006 and 2011. Since the first national rankings came out in mid-August, Harper never dropped from the top spot while Eastfield started as No. 3. Over the course of the year, the Harvesters dropped to No. 4 before jumping to No. 2 in the last poll heading into the tournament. “Ever since the first poll came out, since Harper was at first, our entire goal was to beat Harper,” Caddell said. Players said teamwork and a positive attitude were crucial to getting as far as they did. Reyes said they dealt with many problems throughout the season. In the National Junior College Athletic Association DIII championship match, Eastfield bested defending champions Harper College of Palatine, Illinois in four sets (25-21, 22-25, 25-21, 25-17). In the first set, Eastfield took an early lead. Harper kept the score close and finally took the lead 19-18, but the Harvesters reacted by winning six of eight points to take the set. The second set saw both teams battle through the first half and neither team took more than a two-point advantage. Harper broke the deadlock by scoring four straight and leading 18-14 and not giving up the lead to win it. Eastfield responded in the third set by scoring four consecutive points and winning 10 of 15. Harper did close in on the Harvesters’ lead, trailing by one point on three occasions, but Costlow got three straight kills at the end to win the set for Eastfield. The final set opened up with a long rally that ultimately went in Eastfield’s favor. They held on to the lead and never looked back, winning six of the last nine to close the match. Coach Brandon Crisp said the feeling was “surreal” but said he finally feels relaxed after the season’s conclusion. Costlow said she appreciated how the school stood behind the team, with the Office of Student Engagement and Retention holding a watch party on the first day of the tournament Nov. 11 in the Pit. The team qualified for the national tournament after dominating their conference by winning all their regular season matches, and dropping just two sets in the Metro Athletic Conference tournament. Once there, they swept an undefeated Jamestown (3-0) in the quarterfinals and Central Lakes (3-0) in the semifinals to advance to the final for the first time in team history. “It was a goal that we had set in mind but I never pictured that we could actually do it,” Reyes said about winning the national title. Reyes was named the Most Valuable Player of the tournament, racking up 15 kills, 14 digs and two service aces the championship match. Throughout the tournament, she tallied 33 kills, 22 digs and 16 service aces and finished as the nation’s leader in service aces with 118, 21 more than any other player. Caddell and Costlow were named into the All-Tournament Team. Caddell finished with 100 assists at nationals and had the fourth-highest tally in the nation with 968 assists. Costlow finished with 30 kills in the tournament and 232 for the season. Crisp earned the Heidi Hutchinson Coach of the Tournament award for leading Eastfield team to national glory. Sophomores Alyssa Tomlin, Faith Faulkner, Fredrickson and Costlow end their careers at Eastfield with a third and first-place finish at the national tournament. Crisp said it’s difficult to lose such “phenomenal” players who were vital to the team’s success. Middle blocker Alex McPherson said with the title, the team “leaves a legacy” for years to come. Costlow said the team’s success this year will contribute to success in the future. “For us as a team to go all the way, it’s a big deal for recruits for the next coming years because they’re gonna know they have to live up to that now,” Costlow said. Reyes recalled when she came off injured in the conference tournament semifinal Oct. 27, she felt the team’s unity. Caddell and Costlow said the team’s first win was significant to everyone. “I think it means so much more knowing that we come here just on passion.” Caddell said. Costlow said that being a junior college athlete only demonstrates their commitment to the team and to the sport.